With more than 750 pubs to choose from, Dublin is better known for its nights than its mornings. Live music, serious pints, and great conversation can keep going into the wee hours. But as day breaks, the city gets busy readying for brunch. The late morning meal is quickly becoming one of the most popular ways to pass a lazy weekend in Dublin. In the Irish capital, brunch means mates, indulgent menus, and (more often than not) a cocktail or two on the side. Coffee on the side: 3fe (32 Grand Canal Street Lower) has gained notoriety around the world for its excellent house roasted coffee. But the roaster handles more than just beans, and is the best place in town for brunch if you're serious about caffeine. Many of the dishes come with a coffee twist, like the French toast served with orange syrup, chocolate whip, and espresso butter. New classics: While everyone craves a full Irish now and again, the Winding Stair bistro (40 Ormond Quay Lower) offers a chic update on classic dishes. 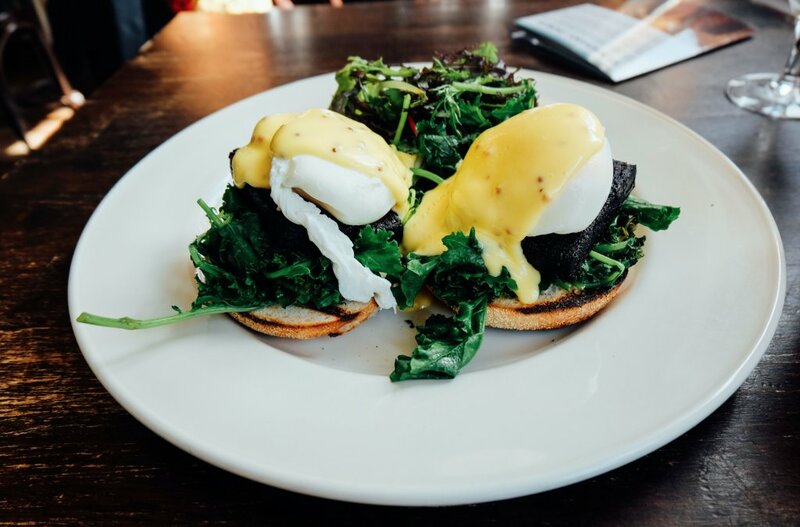 Choose from gourmet sausages or poached eggs on wild greens while looking out over the River Liffey. The understated chic cafe sits above a bookstore and offers a calm start to the day after a big night out. For the late riser: Missed the morning? No problem. The Sunday dinner at Brookwood Dublin (141 Baggot Street Lower) starts at 1 pm and there's no shame is ordering a roast for brunch. The classy restaurant knows its meat, and the perfectly cooked roast comes with all the fixings. Veggie lover: Not into meat in the morning? Or ever? Cornucopia (19/20 Wicklow Street) offers a contemporary menu that caters to any and all dietary restrictions. Gluten free or vegan, but still full of flavour, the brunch menu will satisfy carnivorous friends as well. Jump start your morning with a cold pressed juice and a ginger shot, then move onto scrambled tofu and homemade vegan sausage. The Brunch of Champions: If you only have time for one brunch, make it the Brunch of Champions at San Lorenzo's (73-83 South Great George's Street). Leave the crossword puzzle at home because the weekend brunch spot is one of the most popular in town. (Possibly because the Bellinis can be ordered by the pitcher rather than the glass). The brunch is so well known that you are forewarned that you only have the table for 1 hour and 15 minutes. Make the most of the timed experience by going big and ordering the signature breakfast with butcher's sausage, black pudding, bacon, mushrooms, tomato, baked beans, duck fat home fries and 2 fried eggs. Sweet start: For a sugar fix first thing in the morning, grab a table and a cuppa at the Queen of Tarts (Dame Street). The bakery's drool worthy cakes, pies and tarts make it hard to choose just one. In addition to sweets, the Queen of Tarts has savoury quiches and omelettes during the weekend brunch. For more check out Expedia's 72-hour guide to Dublin! What's your favourite brunch spot in Dublin? Clayton Hotel Dublin Airport places guests a 7-minute drive or shuttle ride from the terminals. It's a 20 minute cab journey to visit the delights of Dublin's city center or famous coastal villages of Howth and Malahide. Located in the center of historic Dublin, just off O'Connell Street, this modern seven-story hotel is a short walk from the Writers' Museum and the lively nightlife of Temple Bar. Situated near the airport, this eco-friendly hotel is within a 15-minute walk of Croke Park, Garden of Remembrance, and James Joyce Cultural Centre. Parnell Square and Dublin Writers Museum are also within 15 minutes. Located in City Centre North, this romantic hotel is within a 5-minute walk of Rotunda Hospital, Garden of Remembrance, and Parnell Square. Ha' Penny Bridge and General Post Office are also within 10 minutes. Located in Dublin's city centre, 100 metres from the Dublin Writers Museum and a short walk away from the bustling shops of O'Connell Street. Henry Street, Temple Bar, and the Trinity College are also close at hand. Maldron Hotel Parnell Square is the perfect base for a Dublin city break. This contemporary, five-storey hotel is located five miles from Dublin Airport and three miles from Malahide Village and Castle. There is a shuttle bus from the airport to the hotel. Located across from Dublin’s 3Arena, the Gibson hotel, an Ascend Hotel Collection® Member, is a 10-minute walk from Convention Centre Dublin. Guests can drive 15 minutes to London Castle and Trinity College, and 20 minutes to Dublin Zoo. Dublin Airport is a 15-minute drive from the hotel. This family-friendly Dublin hotel is located in the historical district, steps from Parnell Square, Garden of Remembrance, and Dublin Writers Museum. James Joyce Cultural Centre and General Post Office are also within 10 minutes. This modern hotel overlooks the Bord Gais Energy Theatre and is 50 meters from the River Liffey on the edge of Sir John Rogerson's Quay. Dublin City Center, Croke Park, and the 3Arena are within 2 km (1 mi). Housed in a 19th-century mansion set in landscaped gardens, Clayton Hotel Ballsbridge is a 5-minute walk from RDS Main Arena and 10 minutes by train from downtown Dublin. Aviva Stadium is a 10-minute walk from the hotel, Guinness Storehouse a 15-minute drive. Built in 1828 and in 4 acres of gardens overlooking Dublin Bay, 500 meters from Dun Laoghaire Pier and the Maritime Museum, this historic hotel was renovated in 2007. Located at 1.6 miles is the Royal Irish Yacht Club. The Peoples Park is 2 miles away.